Shortly after Directive #21 was issued in 1940 authorizing the attack on the Soviet Union, Hitler personally intervened to assign it the codename to which it would henceforward be known: Barbarossa. He chose as his paragon the Germanic hero and twelfth-century Holy Roman Emperor Frederick I, known as "Barbarossa" from the Italian for "redbeard." In 1190, while leading the Third Crusade, Barbarossa drowned and his body was lost. Ironic of Hitler to choose such a murky symbol: a Crusader who failed in his holy mission to the East. But, why did Barbarossa fail? Now, four veteran designers combine in a unique offering from Against the Odds. The ATO Annual edition for 2010 includes four different games, which each address this question. Ted Raicer with "Hitler Tuns East"
Ted may be most famous for Paths of Glory but his experiences with WW2 are solid as well. His design looks at this decisive campaign through the lens of Command. On both sides powerful dictators issued sometimes very detailed instructions to not-always enthusiastic commanders, who in turn were often more interested in their own career advancement (or in the Soviet case, personal survival) than the overall strategic picture. Initially faulty command decisions almost cost Stalin the war, but in the end a lack of strategic focus brought about the first major defeat of the German Army. Mike has given us Monty’s Gamble, Shifting Sands, Not War but Murder, Birth of a Legend and many others. 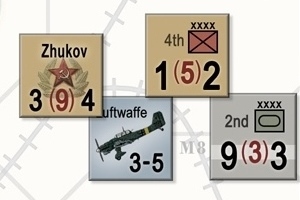 His game models two of the outstanding realities of the campaign, the limited routes available to the Germans as they battered their way to Moscow by using a point to point map, and the tremendous and continuous bloodletting both sides suffered in this "war without mercy." Roger Nord with "Strike the Bear"
Roger is well known to ATO members for his WWI designs The Big Push and Verdun: A Generation Lost. 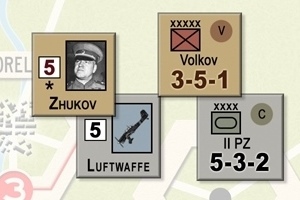 Roger explores how each side attempted to reach victory by controlling objectives across the map. But to underscore the fluidity of the campaign, these objectives can and do change over the course of the war (a player’s objectives may change even quicker, perhaps in the middle of a turn!) The uncertainty of where and when forces must shift to achieve their territorial goals reflects the doubts and hesitations of each side’s high commands. John Prados with his "Codeword: Barbarossa" John is associated with some milestone games, like Third Reich and Cassino, and his Fortress Berlin rates as one of ATO’s most popular games. His design examines how pre-war planning, deceit and deception, and foolishly projecting one's own capabilities on the enemy were THE key factors in explaining what really happened in the fateful year of 1941. So why did Barbarossa fail? Our designers have drawn some very different and startling conclusions about what really happened, and modeled it in four very different approaches. "Four Roads" offers four complete simulations that will provide hours of challenging play and comparison. As always, this Annual features an "extra-size" magazine, with an in-depth look at the history behind the games, plus other articles. Make yourself the proud owner of these challenging looks at the decisive campaign of WWII. Bonus Item: Purchase this issue direct from us and we'll include a set of free link rules tying all four games together plus variants. 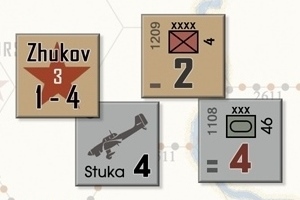 Have the ultimate Barbarossa experience by fully exploring the choices that shaped the campaign! 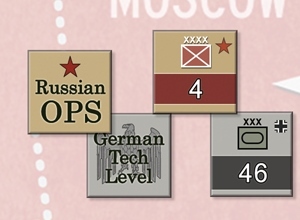 See map graphics for all Four Roads to Moscow games. Download the rulebook for Codeword: Barbarossa (in PDF format). Download the rulebook (second printing) for Hitler Turns East (in PDF format). Download the rulebook for Strike the Bear (in PDF format). Download the rulebook for Slaughterhouse (in PDF format).